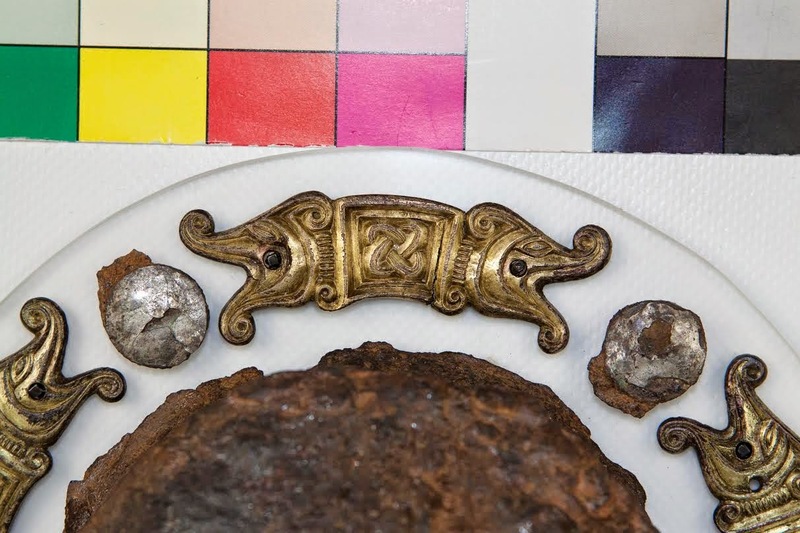 In the previous article we discussed the importance of the early Anglian cemetery of Bidford-on-Avon and the unique shield remains found in in a warrior grave known as grave-182, excavated in 1923. While this mixed-burial-rite cemetery has yielded many impressive finds (mostly dated to the 6th and early 7th centuries) the grave-182 shield remains are of huge interest and have few comparisons. Following two years of research, acquisition of materials, and after personal examination of the finds (kindly facilitated by the Shakespeare Birthplace Trust Collections Dept. ), we attempted to produce a convincing reconstruction of what this high-status shield may have originally looked like, using authentic materials and techniques. The result, we hope, will help shed new light on and raise awareness of the long forgotten find, allow the story of the find to be told, and allow greater appreciation of the skilled craftspeople who built the original. Following much research and planning, the first task was to commission an accurate replica iron boss. Although most images of this boss show a tall straight-edged cone, these pictures are actually of an artful papier-mâché reconstruction made at some point during the last few decades to demonstrate the placement of the gilt copper-alloy appliqués. This was necessary due to the disintegration of the iron boss post-excavation. Close examination of the original (largely disintegrated) boss, show that it had had a slightly shallower and more domed cone than had been implied by the oft-photographed replica. These invaluable insights helped inform our more accurate reconstruction. We noted that this boss required a slightly wider than usual flange in order to accommodate the beast appliqués and a wide and robust button to accommodate the apex disc. The challenging task of fabricating the boss was undertaken by the talented Jason Green of Wieland Forge. True historic smith-craft is not an exact science, yet Jason was able to produce a boss that is very close to the specifications of the original. In particular, the replica boss Jason produced had a button of precisely the dimensions necessary to best support and visually 'frame' the decorative disc (as with the original boss) and a flange not only broad enough but with the correct curvature (linking to the diameter of the boss itself) that it matched the curve of original flange-appliques. The impressive decorative beast-headed gilt copper-alloy mounts and apex-disc for the boss were commissioned from our associate historic jeweler George Easton of Danegeld. George was able to replicate the appliques precisely and to the exact dimensions of the originals (Dickinson, 2005). To see the fittings as they would have originally looked, with their gilding restored, was a truly exciting moment. The appliques were applied to the flange of the boss in the correct positions using soft copper-alloy rivets, while the decorative button-disc was (like the original) applied with solder later. Construction of the shield board began with selection of the appropriate timber. In Anglo-Saxon poetry, the timber synonymous with shields was that of the lime or linden tree (Tilia sp. ), yet pollen records indicate that England's lime population was extremely limited by the early Anglo-Saxon period (having fallen sharply during the Bronze Age) (Rackam, 2006), and analysis of cemetery finds indicate that, contrary to poetic references, lime was very rarely used for shields (Dickinson & Harke, 1992). Looking across the corpus of Anglo-Saxon shields where wood has survived for examination, it would seem that willow and poplar were most favoured (if we are to assume no sampling error due to differential survival in the soil) but there remains a huge variety, with even oak occasionally used (Dickinson & Harke, 1992). It is reasonable to assume that the selection of shield board material involved a number of trade-offs, including density, grain, hardness, split resistance, availability, and the ease with which a material could be shaped. While one might expect warriors of a particular settlement to have built their boards from whatever material was locally available, examples such as the shields from the Tranmer House cemetery suggest that, at least for high status individuals, it would not be unheard of for more desirable shield timber to be imported from neighboring areas. In the Tranmer House case (Bullock et. al., 2011), the imported material in question was ash (Fraxinus excelsior); a wood not available locally and relatively rarely used for shields (although synonymous with spear-shafts). Ash is only slightly less dense than oak and would have represented one of the very 'heaviest' options for a shield board (Dickinson & Harke, 1992), but its extreme split-resistance (exceeding, by a large margin, that of all other timbers known to have been used for shields) may have explained its desirability by the early 7th century elite buried at Sutton Hoo. As the Bidford-on-Avon cemetery was excavated before the days of modern archaeological analysis, we were not able to determine from the published material what wood this high status shield was likely to have been constructed from. Nevertheless, the limestone-dominated landscape within which Bidford sits naturally favours woodland communities featuring ash, and would likely have done so in the 7th century as much as today (Rackam, 2006). With the relative abundance of mature ash, locally, it is hard to imagine that the inhabitants of the Avon valley would not have considered this strong timber for the manufacturing of high status shield boards. For our reconstruction, we were lucky enough to be able to source 10-year seasoned air-dried ash planks hewn from a tree felled only 12 miles away from Bidford-on-Avon itself. In England actual shield-board timber never survives other than as ‘pseudomorphs’ in the metallic corrosion products, which sometimes are detailed enough to determine the actual species of timber used for the board. The thickness of the board thus has to be determined indirectly by measuring the free length of rivets or clench-nails which penetrate the board. The three candidates are boss rivets / clench-nails, grip rivets / clench-nails and board studs. While the former, when extant, give an indication of the approximate thickness of the board (including, taking into account some compression, the animal-hide layers) at the center, the latter give an indication of the thickness further along the board, while rivets on long-type grips can give an indication of board thickness closer to the edge. Following this logic a shield with a hide-wood-hide sandwich construction would need thinner planks than a wood-hide (open-back) shield of the same overall thickness, though additional compression of the second hide layer should also be taken into account. (C∝HL). Thus, if we assume that a hide-wood-hide sandwich shield with quoted rivet-length 8mm was made with two layers of conventional vegetable-tanned leather approx. 2mm thickness (front and rear faces), and that this leather compressed by 50% (probably an over-estimate) at the rivet during manufacture, it would be reasonable to use planks of approximately 6mm thickness. While boss rivets are usually the most reliable indicator of board thickness, in the case of the Bidford-on-Avon 182 shield the iron of the rivets had 'rotted' away completely, leaving only the tin caps. Board studs seem to have occasionally been mounted on underlays of leather or even thin laths of wood, so are an unreliable measure of board thickness, and, besides, the shanks of these too were not extant with respect to the 182 find. We were, however, able to infer from hide "pseudomorphs" the shield's grip fragments (on the outer or back-side only) that it was unlikely the back of the shield had a hide layer. We estimated the board thickness from the curled-up remains of the grip-nails. Using the above formula, we obtained a figure of around 6mm for the thickness of the ash-planks. Bidford-182 shield remains (Humphreys et. al., 1924) showing grip and clench-nails (right). According to analyses across a large sample early Anglo-Saxon shield-board thicknesses seem to cluster ( Härke and Dickinson, 1992), with 75% of the values falling between 6-8mm with a peak at 7mm and an overall average of 7.5mm. These figures correlate well with data from Continental shields from the Roman Iron Age through to the Viking Age. Obviously these thicknesses relate to the central portion of the shield. Where thickness at the edge can be inferred from distal features, thinning towards the edge is often indicated, and our board was shaped to reflect this. Overall board thickness looks to have been a matter of local preference and may have reflected the type of timber being used. It may well be that the use of ash - a heavier wood but with exceptional resistance to splitting, allowed the board to be thinned, whereas a shield constructed from very light poplar would have needed to be thicker. Our shield was constructed using 10 year-old ash-wood using planks approximately 12mm thick which we laboriously thinned to 6mm overall and a little less at the rim, roughly consistent with shields from neighboring graves in the cemetery (grave 33 and 207; at-rivet total thickness 8mm and 6mm respectively) and with contemporaneous shields from neighboring cemeteries (Härke and Dickinson, 1992). This was achieved by use of traditional tools including adzes, gauges and chisels, the tool-marks of which remain visible on the back of the board. It is interesting to note that the original excavation report from 1924 estimated the board thickness of the Bidford shields to be around ½inch! Shield size seems to have correlated to some extent with age, with young individuals buried with smaller shields, and there is, further, a general trend towards slightly larger shields moving from the 6th into the 7th century (although this corresponds to the gradual phasing-out of weapon burials, beginning with the young, thus skewing the sample). Overall shields in the "Medium" category are most common, and, for the most part, such shields (particularly the upper end of this range) are of a sensible size for use by adults in combat. This is also true of the comparatively rarer shields in the "Large" range. However, shields in the "Small" range would have been of little use either in loose skirmishing combat or in a shield-wall. Rather than being functional objects, it seems that such shields were symbolic and scaled down to more easily fit into a typical grave-cut; the martial equivalent of the purely symbolic miniature combs and toilet-sets occasionally found in cremation burials. With the diameter of the Bidford-182 shield and others in the cemetery not known, settling on an appropriate size for the reconstructed board was difficult. In the end, taking into account the known sizes of shields in neighboring contemporaneous cemeteries including Stretton-on-Fosse-II, we settled on making the reconstructed board for Bidford-182 fit into the upper end of the "Medium" range. We sawed the planks for the shield to produce a board 68cm (27 inches) in diameter; a feasible size which seems in proportion with the boss and other fittings. The proposed user of the replica, who is 172cm tall finds this size of shield ideal. Interestingly, at Bidford, the mean stature of males was estimated to be 170cm (Humphreys et. al., 1924). Unfortunately, the height of the Grave 182 occupant is not noted in the excavation report. The next task was to glue these together. This was achieved using hot, evil-smelling animal glue. Once dry, the resulting unions were unexpectedly strong, even though the ash planks were only 5-6mm thick. Following some early preparations for the shield's edge (discussed later), the hide 'cover'; a single piece of 2mm thick veg-tan leather, cut to shape, was later applied to the front of the board, dry, with the same hot animal glue. Despite the fact that the front side of the board had been carved down, all around, at the edges (as previously discussed) the leather conformed to this slightly dished surface without any need for molding, and adhered firmly and neatly. The function of the grip is to enable the shield to be held comfortably and enable it to be moved about efficiently. To that end, the aperture cut into the middle of the shield board needs to be of an appropriate size so as to easily accommodate the hand holding the grip and shaped so as to cause minimum discomfort (particularly to the dorsal surface of the hand) as the shield is moved about. The short flat I(a) grip is really just a simple strip of iron pierced with a nail or rivet at each end. It is the most frequent type found (55%) in all English regions. The Bidford-on-Avon 182 grip is clearly a Type I(a)(i). This type is found frequently in graves dating to the 5th-7th centuries associated with all types of boss. Boss Type 2’s -like the Bidford-on-Avon 182, are overwhelmingly associated with Grip I(a)(i). With previous shield reconstructions, we have avoided Type I(a) grips (preferring the more robust I(b) where the iron flanges are hammered around the wooden grip) as we had never been convinced of the mechanical strength of the design (particularly for a relatively heavy shield) where the whole weight of the shield rests on the strength of a thin flat strip of soft iron perhaps only 1½mm thick. Traditionally, the Type I(a)(i) grips have been reconstructed with separate wooden components lashed to the iron. However, Härke and Dickinson (1992) note that some examples show evidence of the organic grip (wooden) component being continuous with the board planks. This design (Grip type D2) has obvious advantages in terms of strength and simplicity. Type D handles, according to Härke and Dickinson are also associated with higher than average burial-wealth (and thus status). They comment that this highlights their more difficult construction. We are not sure we can agree with this last statement, as it really was no more difficult to cut two small D-shaped holes leaving a continuous wooden bridge in the shape of the iron grip-plate than it would have been to cut a simple circular hole to be bridged with another piece of wood. It should be noted that the grip was placed slightly off-center, so as to allow slightly more room for the fleshy part of the hand. This design (described by IP Stephenson (2002) as the "Figure-of-eight or cottage-loaf type") is far more ergonomic than the "bridged circle" arrangement typically seen on replica Anglo-Saxon shields and has been identified both in Migration and Anglo-Saxon contexts (one of the Thorsberg shields, and the Winterbourne Gunner Grave 1 respectively). Returning to Bidford-182, close examination of the original grip-plate showed it had been attached not by rivets but by clench-nails; the rusted remains of which were still present. The thin replica iron grip-plate, fashioned to the precise dimensions of the original, was thus fixed into place on our replica using soft iron nails. The handle was slightly carved, then bound tightly around with a strip of goatskin to produce a comfortable rounded grip, the latter being a feature observable on many type-I grips (Dickinson & Harke, 1992). We are now convinced that this is as good a design ergonomically as the flanged type, if constructed in this way. Before application of the shield cover, consideration had to be made for how the edge of the shield was to be completed. 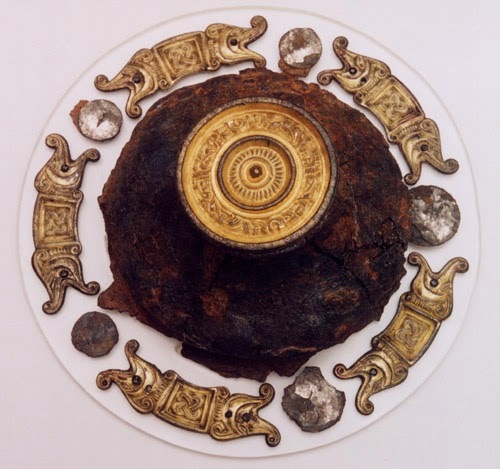 Most manuscript depictions of Anglo-Saxon shields show a discrete rim. What is not clear is what material the rim was made of. The highly atypical Sutton-Hoo shield had a copper-alloy rim but this is most unusual and there are few other good examples; one recorded instance (Grave G2 at Finglesham) of a rim made of iron strips was lost long ago and is not available for study (Härke and Dickinson, 1992). Certainly there were no remains of such a rim in the case of Bidford-182, so the edge of this shield, like most, must have been finished with organic materials. Most lærigas must have been made from ordinary leather, cuir bouli or rawhide. We decided to opt for simple strips of leather which were attached by stitching. Holes were drilled in the board and smoothed (so as not to cut the thread) prior to addition of the cover, which, after addition was pierced using a diamond awl in the positions of the pre-drilled holes. The edge strips were then added with stout waxed linen-thread using a two-needle saddle-stitch technique, tightly tying off every few stitches. Corroboration of this method of attachment comes by way of later Viking shield-boards which have been wonderfully preserved in wet, anaerobic conditions, and the 3rd century Roman shield from Dura Europos. Both of these have holes along the edge consistent with having had a leather rim attached by sewing (Stephenson, 2002). The next step was to attach the boss to the board. Although it is not unheard of for bosses to have been attached by means of clench-nails, bosses with extant fixings found at Bidford were attached by means of the (more typical) rivets. Custom-made large flat-headed iron rivets had been previously manufactured for us by Jason Green of Wieland Forge, with some deliberate inconsistency in rivet-head size to reflect the imprecision of the originals. The original boss had five large grey/silver coloured boss-rivets (of which only the caps remain) so we coated our iron ones with a thin layer of tin. The resultant effect was startlingly like the original. Appropriate holes were drilled into the board to match the five rivet-holes in the boss which had been made prior to the attachment of the animal-headed gilt appliqués. Once the correct length was ascertained, the rivets were cut to size and then peened over small iron roves. Special care was needed to avoid damaging the delicate gilded surfaces. The remaining task was to attach the two board-discs. These exceptional items had been the subject of some confusion, and were noted in the original excavation reports as silvered (Humphreys et. al., 1925); possibly the result of confusion with other disc-fittings found at the site, or else a result of the remains of the flakey gold layer not having been immediately obvious. 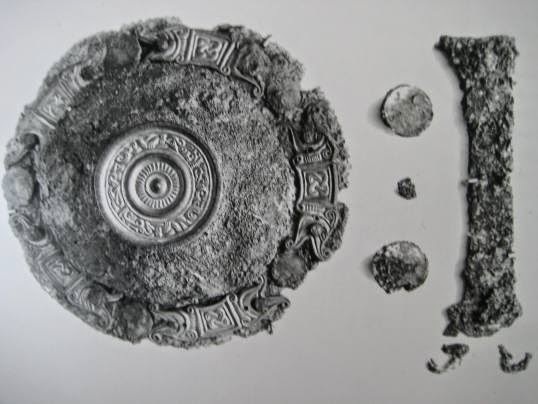 Certainly at some point later the disc fittings were found to have not been silvered, but were in fact of gilded silver, such that Tania Dickinson in her cataloging of metallic shield fittings was forced to place them as "d. non figural gilded mounts" rather than the more natural "a. circular studs and discs" . Paired discs like this are the most common type of English shield-board fitting, although most are of iron. A few are of copper-alloy, while fewer still are silvered. Gold-covered fittings are exceptional. Most of these discs are between 20-40 mm in diameter, with rare ones reaching as much as 80mm. Usually regarded as purely decorative, the highly visible discs may well have had a proto-heraldic function, identifying the shield-wielder in the confusion of battle. It is further possible that these gilded discs might in some way tie in with the imagery of the shield, discussed in the previous article. Our 3cm diameter discs were made specially for us by Danegeld, with highly reflective gilded surfaces. Clear evidence indicating the position of these fittings on the board was not available. 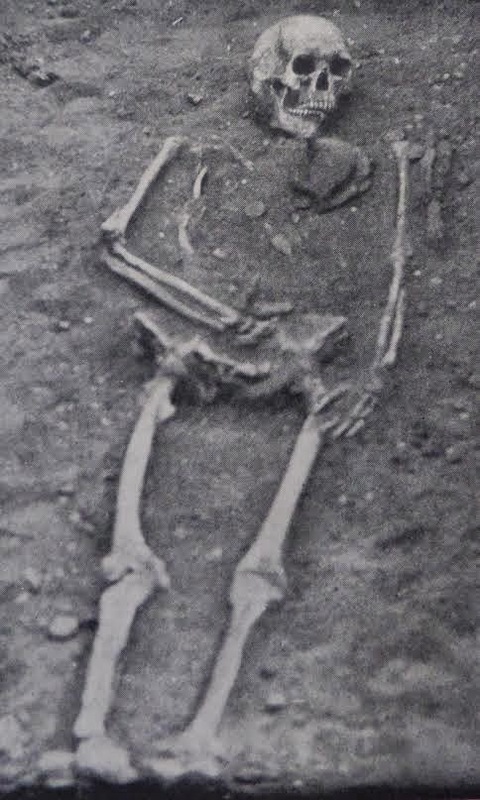 However, a picture of a grave with finds in situ from the first Bidford-on-Avon excavation report (Humphreys et. al. 1923) provided valuable insights, clearly showing similar disc fittings arranged on opposite sides of the central boss. This is easily the most "obvious" choice for arrangement of such fittings on a circular board and although arrangements varied (often with two pairs on opposite sides of the board, particularly in the Upper Thames region) the arrangement photographed (likely grave 33), symmetrical and pleasing to the eye, is not an uncommon one. In the absence of better evidence pertaining to grave 182, we installed the discs in the same arrangement as grave 33, each approximately mid-way between the boss-flange and the shield edge. For peace of mind these valuable components were secured in place by means of riveting each over a small copper-alloy rove. It would be hard to imagine a valuable shield suffering exposure to the ever-changing conditions of a campaign without some kind of surface treatment. The precise treatments used to both "polish" and weather-proof items such as shields are not known, but the application of natural oils and waxes to feed and waterproof the leather would have been a sensible, if not crucial precaution to take. The leather of the shield was treated by vigorous application of our home-made leather-polish; a mixture of beeswax and linseed oil. Both ingredients would have been fairly expensive in Anglo-Saxon times but fairly available. After some considerable work, a warm rich tan colour was achieved (becoming warmer over time) and the surface became somewhat scratch-resistant. The result of almost two years of research and preparation in addition to significant amounts of ‘blood and treasure’, the Bidford-on-Avon 182 reconstruction is, we believe, a good attempt to show how this shield may have appeared when it was placed in the ground with its owner so long ago. While many (perhaps most) early Anglo-Saxon shields would have the rear face covered with leather; we have kept the ash-wood planking bare of covering so that the four plank construction can be seen, along with wonderfully tactile surface produced by the hours of tooling. The original may well have had padding inside and around the hand-hole but again we have left this open so that the board thickness and handle construction are more obvious. This shield is not meant, as the original was for violent conflict but as a teaching aid. The symbology of the boss decoration will, no doubt, induce speculation regarding its solar/lunar associations but, as with so many early English decorative motifs, we can only speculate; for we are most unlikely to ever know for sure what these images meant to their pagan audience. We learned a great deal through the process of this reconstruction, but perhaps the greatest lesson was of the importance of a close and personal examination of the original find prior to starting a reconstruction. Photographs and descriptions are good but nothing beats the ability of the trained eye to interpret subtle features on a piece of rusty old iron! The Shakespeare Birthplace Trust: Collections Department, without who's kind help this reconstruction would not have been possible. Rackham, O. (2006). Woodlands (Vol. 284). London: Collins. Stephenson, I. P. (2002). The Anglo-Saxon Shield. Tempus.